Ms. Chantal Daniels stated that “the exportation of minerals is the one of the key incomes for many people but also fuels conflict in the Democratic Republic of Congo (DRC)." However she explained that it is the failure of state governance that is the main problem. For example, there is very little infrastructure whereby basic stuff can be provided to the people. 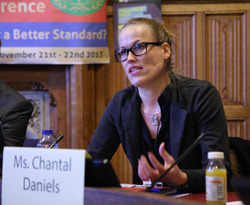 Ms. Daniels continued, 'Christian Aid together with other NGO’s have produced a report with a number of recommendations entitled, ‘Breaking the links between natural resources and conflict: The case for EU regulation’. She explained that the US Dodd Frank law and some local initiatives had unintended consequences that removed the main source of income for the many families as companies mined elsewhere. The EU should make initiatives that deal with the basic principles. They began a consultation and an inquiry to study this area thoroughly before deciding. There is a shared responsibility not just of the DRC, not just the international community, it must include the businesses as well. The EU is to take an initiative that establishes a principle that operates beyond the DRC. A possible initiative for all high risk or conflict affected areas, such as Columbia, Burma, etc. It should examine whether to go downstream to the supply chain from the mine or miner or upstream to the businesses that purchase the minerals for manufacturing. A lot of initiatives have caused an de facto embargo on the mining communities by placing too many obligations on the companies who then go elsewhere to source the minerals they need. We want to have an initiative that allows businesses to not go to other sources. It also needs to be drafted together with local communities. Many initiatives are voluntary but are not effective. The pressure on companies is too much for them to respond to every voluntary code. Therefore legislation and consequences should be written in European law. Any approach should have flexibility to deal with risk mitigation for companies. A conflict can spark at any moment and we should give companies the opportunity to adjust for a period of time. The European initiative should look at all minerals that cause and fuel conflict. It is coal in Columbia, rubber, diamonds etc not just the ‘3 Ts and gold’ (tin, tantalum, tungsten). Any response from companies should be public. We should know what they are doing in negotiation with governments in response to a conflict. The most important point should be that any initiative from the EU or UK should be accompanied with a negotiation with the national government. Any initiative will fail if it does not include the national government in the discussion and planning. Any EU initiative to the DRC needs to be a part of the broader context and especially an improvement in DRC Governance and Regional Peacekeeping.